In this March 9, 2019, photo, Sen. Kamala Harris, D-Calif., speaks during an event in St. George, South Carolina. Democratic presidential candidate Kamala Harris said Thursday that there should be a federal moratorium on executions. 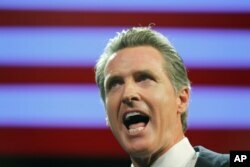 The senator from California discussed the matter on National Public Radio, a day after Democratic Gov. Gavin Newsom of California granted reprieves to 737 death row inmates and signed an executive order placing a moratorium on executions. FILE - California Democratic gubernatorial candidate Gavin Newsom speaks after being elected governor of the state during an election night party in Los Angeles, Nov. 6, 2018. Harris was asked if there should be “a federal equivalent” to Newsom's order. She noted that black and Latino defendants were more likely to be executed than white defendants, as were poor defendants with poor legal representation versus wealthier defendants with good legal representation. As Harris launched her presidential bid, she said she was running as a “progressive prosecutor.” But she has drawn scrutiny from some liberals for “tough on crime” positions she held as a California prosecutor, with her stance on the death penalty among those issues. As a district attorney in 2004, she drew national headlines with her decision not to seek the death penalty for the killer of a San Francisco police officer. That decision, announced days after the officer's death, enraged local law enforcement officials. However, a decade later, she appealed a judge's decision declaring California's death penalty law unconstitutional. While Harris has personally opposed the death penalty, she has said that she defended the law as a matter of professional obligation to the state.